Since we're about to embark on this Luxe For Less adventure together, I have to share the first rule of decorating for less: Compromise. Often, when we think of the word compromise, we interpret it as getting less than what we want in order to make things work out. 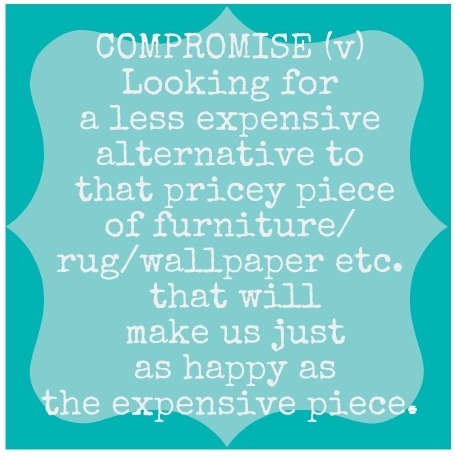 In decorating, you are going to have to give the word Compromise a new definition. So if we're just as happy, where's the compromise? The compromise lies in the fact that you have to let go of your desire for the more expensive piece in order to find something that will work just as well. This isn't always easy, but I've found that in the long run, it is a lot more satisfying. Compromising this way also requires you to think outside the box...and sometimes to do a little research. It's certainly not as easy as buying something straight off the show room floor or out of a catalog, but, in my opinion at least, it can be a lot more fun. Let's take the mirrored TV console in my living room, for example. I actually made many compromises in the creation of my living room (and I actually like it better as a result), but the one we're going to talk about right now is the console. See that pretty mirrored console? It was actually one of the less expensive versions that I found online at a approximately $400 or so (it's not still available so I couldn't find the actual price). Now, for some, $400 is inexpensive. But I knew I could get a similar look for less. My first thought - and it should always be everyone's first thought when it comes to getting a look for less - was to shop my house. But we just didn't have anything that I could turn into a mirrored TV console. So I starting looking on our local classified ads until I found a dresser that I knew would work. Can't you just see it? My husband couldn't. 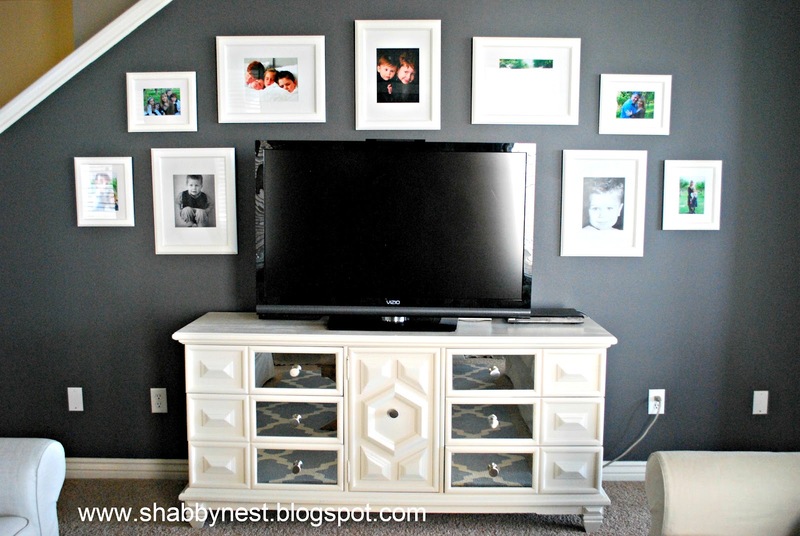 This is when I pulled out my research photos (similar dressers that I'd seen people use for TV stands on various blogs etc.) and showed him the potential. Then I had to research how exactly I could turn this ugly piece into a mirrored beauty. You can read all about the process here. And here's the finished product - for less than half the price of the inspiration piece. Is it exactly like the mirrored console inspiration? No. It's not actually even very similar with it's angular lines, BUT am I happy with it? ABSOLUTELY!! I love it, in fact. And for less than half the price, I might even say I adore it! So, my dear readers, let's learn to compromise when it comes to living LUXE FOR LESS. We can do it... and there won't be any buyers remorse. Do you have any times you've compromised on decor and been happier as a result? I'd love to hear! Such great advise! You really have to be able to see potential in things to make them work! This is soooo true!! My husband and I bought a newly constructed townhome about two years ago and now that we are married (I was waiting for the wedding planning to be over before I dove into the house projects) I am beginning to decorate the house. 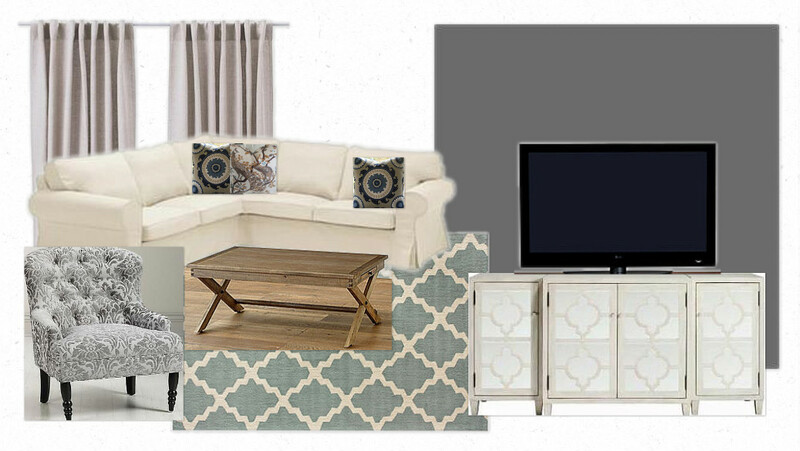 I started checking out DIY home decor blogs (like yours!) and realized a new piece of furniture was a thrift store, some sand paper and paint, and a little time away - for a fraction of the price and perhaps MORE satisfaction than the retail piece. Nice job!! Keep up the good work. You are an inspiration for those just starting out like me! I want that TV stand. But it's probably the only one out there like it! 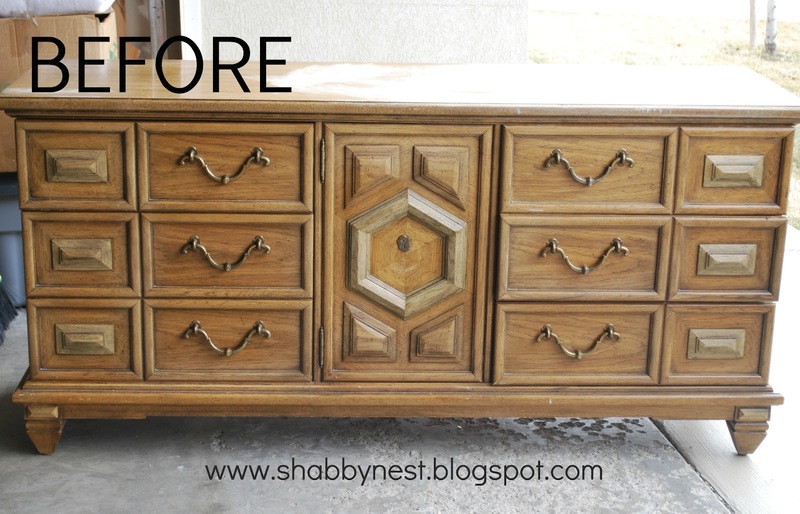 Thats another advantage to fixing up an old piece of furniture, you make it custom. I really like your approach and the direction you're taking your blog; extremely inspiring! Speaking of compromise: I adore Terrain's pierced metal hanging lights but CANNOT bring myself to pay those prices, so what to do? Target (and other places) have great galvanised tin planters with lovely shapes....all it will take to make them into fabulous hanging lights will be a metal punch and hammer (which I have) and a hanging light kit that can be purchased for less than $15.00. Guess where I'm heading this weekend! I love this post and your console! Beautiful! Looks amazing...wasn't even on my radar for a redo but you made it fabulous! Love this perspective! I just need your confidence to try new things like this that seem out of my comfort zone. Thanks so much for all of your inspiration! That is awesome! I love seeing how people transform the truly hideous into things that you would actually want in your house. Wonderful overhaul!